"Phantom" redirects here. For the result when a move connects but deals no knockback, see Glancing blow. For the Chilean smasher, see Smasher:Phantom. Zelda using Phantom Slash in Ultimate. Phantom Slash (ファントムアタック, Phantom Attack) is Zelda's down special move in Super Smash Bros. 4 and Super Smash Bros. Ultimate, replacing Transform from Melee and Brawl. The move involves Zelda summoning a Phantom, a disembodied guardian suit of armor from The Legend of Zelda series, which attacks the opponent and disappears. It can be charged up to increase the range of the move. The Phantom is a solid object in the environment, so it can block movement and attacks of other fighters. Official artwork of a Phantom Zelda from The Legend of Zelda: Spirit Tracks. Phantoms first originated in The Legend of Zelda: Phantom Hourglass, as guardians of a temple that Link must visit at various points throughout the game. They are shown to be indestructible for a large portion of Phantom Hourglass, and getting attacked by one would result in Link being sent to the beginning of the temple. Phantoms in this game come in three variations, each with their own abilities. They reappear in The Legend of Zelda: Spirit Tracks with the same function, although this time they guard the Tower of Spirits and now come in four variations. After Link and Zelda head to the Tower of Spirits, they are ambushed by Chancellor Cole and his apprentice Byrne who take away her body with plans to resurrect the evil Malladus. At some point, Zelda's soul becomes trapped in the Phantom, which results in her controlling its body, and she and Link must make use of the unique abilities of each Phantom. This mechanic proved vital to proceed through Link's quest in restoring the tower and freeing Zelda's original body from Malladus' possession. As Zelda has control of the Phantom in SSB4, the move is most likely referencing Spirit Tracks. Rather than having a cartoonish and cel-shaded design of the Hero of Winds, Zelda's Phantom in Smash is given a more detailed redesign in line with her own, more realistic design. Also, despite being recolored to Zelda's more feminine theme, the eyes do not glow at all (a reference to how non-possessed Phantoms have no visible eyes). Zelda's breaks automatically after using it and must wait a set time, compared to how she can control it indefinitely in Spirit Tracks (but only inside specific rooms). The Phantom missing Yoshi doing his forward tilt in SSB4. The Phantom has three different attacks, based on the charge of the move: uncharged, the Phantom does a quick and weak inwards slash; mid-charged, it does a stronger outwards slash; at maximum-charge, it does a powerful upwards slash that hits twice. While the Phantom is being shot out by Zelda, it can be reflected, which sends it in the opposite direction and changes its ownership. The Phantom is a solid object, so fighters cannot pass through it instantly, and it can be attacked, allowing it to act as a wall. If the Phantom takes 13% damage or more during one summon, it will break, at which point it will disappear and Zelda will be unable to use Phantom Slash for another 9 seconds; a purple cloud aura will appear over Zelda's hand for the duration of this period. Due to it acting as a solid object, making use of this move allows Zelda to control space on the stage, and defend against opponents' attacks or projectiles. Opponents passing through the Phantom (including rolling or air dodging through) can be punished by Zelda due to the relatively low end-lag of the move. The uncharged version of the move is particularly fast, allowing Zelda to summon the Phantom to force the opponent to react, while still having time to potentially shield or dodge counter-attacks. "Summon a Phantom that slashes foes in front of you. Can be charged." "The Phantom travels a set distance and wears down enemy shields rapidly." "The summoned Phantom strikes harder than normal but will not move forward much." Phantom Breaker: Travels a set distance regardless of charge, but deals more shield damage; a half-charged Phantom Breaker can break most shields in one hit. Phantom Strike: The Phantom appears next to Zelda regardless of charge, but deals more damage. Each possible hit except the first hit of the fully-charged Phantom Strike deals set knockback. Phantom trophy in the 3DS version. The Phantom works slightly differently from Smash 4. In Ultimate, when charging, the Phantom appears behind Zelda and assembles itself. The move has six different different charge stages. In order: a kick, punch, an outward slash, a downward slash, and an upwards slash. Once the Phantom is fully assembled at its sixth stage, Zelda is able to move and attack freely, while the Phantom momentarily remains still until attacking with a dashing sword slash. The Phantom can be destroyed by interrupting Zelda mid-charge or by dealing enough damage to the Phantom. If destroyed, the Phantom will remain broken on the ground for two seconds, but can be resummoned as soon as it disappears. Phantom Slash is the only special move of Zelda's to not be based on a spell from The Legend of Zelda: Ocarina of Time. When Phantom Slash is reflected, the color of its armor changes. Its overall tone is darker, the pink armor becomes more of a rusted color, and its blue-purple armor becomes more of a grey-tinted blue. This is reminiscent to Spirit Tracks, where a Phantom possessed by Zelda would have a lighter color scheme than an independent one. In the Zelda games for the Nintendo DS, Phantoms are created merely by dark magic, but Zelda has not been seen to have any access to use dark magic. Her summoning one, however, is similar to Lokomo Anjean doing so for the final battle in Spirit Tracks, albeit without the use of dark magic. Palutena remarks in Super Smash Bros 4 via Palutena's Guidance that the magic used to create the phantom is dark magic, "Pretty dark magic" in her own words. 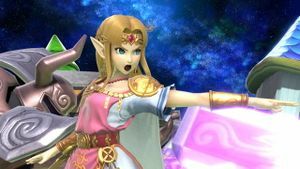 Due to Zelda in Super Smash Bros Ultimate having the same abilities, she likely has access to dark magic as well. Whether this can be taken as canon is arguable though. If Zelda summons a Phantom and it gets destroyed and she is KO'd afterwards, she will be temporarily unable to use the move as usual but the purple cloud on her hand will disappear. A Phantom summoned by a Master Shadow version of Zelda will be entirely black. The Phantom striking Fox in Super Smash Bros. for Wii U.
Phantom Slash shown by a Skill Preview in Ultimate. This page was last edited on April 11, 2019, at 23:22.